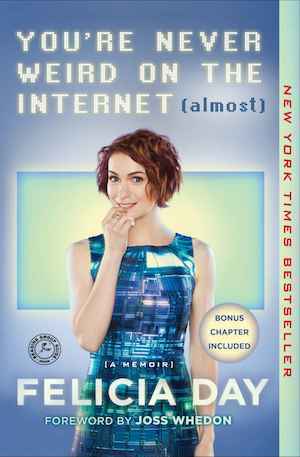 You’re Never Weird on the Internet (Almost) by Felicia Day is a comedic auto-biography. Well known within the blogging/vlogging community, Day is also something of a minority, as she is a prominent female gamer. In addition, she has gained acclaim for her web series The Guild and is noted for her accessibility within the fan community. As part of this, Day launched Geek and Sundry, a fan-oriented community in 2012. What follows is a surreal moment in which neither the mother, her daughter, or the sales clerk recognize her, raising the defensive ire of the “Hot Topics” as Day has dubbed them. Extracting herself from the situation as gracefully as possible, Day heads to tour the Virgin Galactic hangar as part of a social media invite. Such is the surrealness of her life, she reflects. Based on those two factors, Day makes the assumption that the reader is either extremely excited to read her book (“OMG! FELICIA DAY WROTE A BOOK!”) or extremely confused (“Who the hell is this chick?”) For those in the former category, she thanks you. For those in the latter category she hopes you will stick around. The first chapter, “Why I’m Weird”, details Day’s eccentric childhood. Having attended regular schools for kindergarten and first grade, Day is sent to a conservative Lutheran school for second grade. Her parents were not religious, but the school was the best in their Alabama community. Day reflect that she enjoyed the school except for having to attend chapel everyday. Due to a chapel illustration involving the burning of money, Day is soon pulled out of the Lutheran school and placed into a school that practices “unschooling.” Day states that she does not remember much about that place except that they quickly closed, having embezzled the parents’ money. Soon Day’s father is transferred from Huntsville to Biloxi at which point it is decided that Day and her brother Ryon will be home-schooled. This goes well for about a week until any semblance of structure in their lives gradually ebbs. Having just moved and not being on any official government lists, there is no one to supervise their schooling. Art becomes something along the lines of “Can the doodles in the margins of my geometry chapter count as art?” “Sure!”, and history becomes driving around the state visiting all the Civil War sites. The one constant in their education is that they are expected to read constantly. Eventually Day’s father becomes concerned, and Day and her brother are signed up for an extensive array of lessons. Ballet, jazz, martial arts, watercoloring, etc. If it was available and fit into their schedule, Day and her brother were signed up for it. Eventually Day makes her way to the end of her education and, during the writing of her book, realizes she has two college degrees but no high school diploma. Having done some acting and modeling as a child, Day decides to return to Los Angeles after college to pursue an acting career. Two months after moving, Day wraps up her first real acting stint and is cut a check for 90 dollars which bounces. On follow up, Day finds out that the production company had shut down and disappeared. She never got paid. She does, however, decide to frame the check as a funny story to tell on Actors Studio after she is successful. In 2005, at the peak of what Day refers to as her “auditioning for burger commercials” career, her brother invites her to play a new game called World of Warcraft. Through the game, Day is able to connect with her brother and make new friends, but quickly becomes addicted, forgoing auditions, personal relationships, and most outside activities. Day later draws on her experiences during this time in the creation of her web series The Guild which, in turn, is the work that finally launched her career. You’re Never Weird on the Internet (Almost) is a fun and honest look into the early life and struggles of someone who has managed to make a career out of being socially awkward. The Guild has won several awards for online series, and in 2009 was labeled “one of the Nets best serial shows” by Rolling Stone. Geek and Sundry was launched in 2012 as part of YouTube’s 100 million dollar original channel initiative. Day writes in an easy, conversational voice. The tone of her writing belies the fact that Day is, in fact, an intense intellectual who started college at the age of 16 and graduated in the top four percent with dual degrees in mathematics and violin performance. While her insecurities may seem off putting to some readers, Day manages to remain relatable with her comedic self-deprecation. Readers who enjoyed Just A Geek by Wil Wheaton, or Let’s Pretend This Never Happened by Jenny Lawson should enjoy You’re Never Weird on the Internet (Almost). All three books are written by celebrities who exude more of an Everyman persona. Each of the authors is well known for their approachability and their frequent, personal interactions with fans. All three authors have also shared intimate details their mutual struggles with anxiety and depression, allowing insight into their treatment, how these issues have impacted their careers and their creative efforts. Finally, the three authors have developed lasting personal friendships with each other. This has resulted in overlap in not only their books, but many of their professional endeavors. You’re Never Weird on the Internet (Almost) is a fun and quirky read accessible even to those who have never heard the name Felicia Day.